Congratulations to Imaginary Forces on their Outstanding Main Title Design Emmy win for Stranger Things and composers Michael Stein and Kyle Dixon for their Outstanding Original Main Title Theme Music award for the same series. Imaginary Forces has previously received the Emmy in Outstanding Main Title Design for their work on shows Manhattan, Mad Men, and Masterpiece Theatre: The American Collection, as well as nominations for Magic City, Boardwalk Empire, Human Target, Nurse Jackie, The Pacific, and Rubicon. Stranger Things is Creative Director Michelle Dougherty's first win. 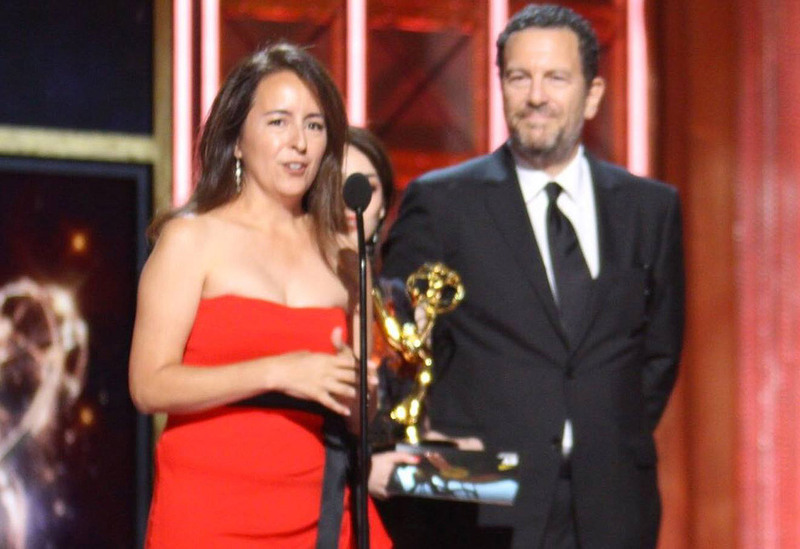 Michelle Dougherty and Peter Frankfurt of Imaginary Forces accept the Outstanding Main Title Design award at the 2017 Creative Arts Emmy Awards. The 2017 Emmy nominations were announced on July 13th, including the nominees for this year’s Outstanding Main Title Design award. Studio Elastic continues its four-year nomination streak, earning three nominations this year for the openings of Starz’s American Gods, Netflix’s The Crown, and HBO’s Westworld. Elastic now matches Imaginary Forces' record for three nominations in this category in a single year, which was set in 2010. The record for the most nominations for an individual designer in a single year still belongs to title designer Billy Pittard, who earned four nominations in 1997. Elastic previously won the title design Emmy in 2016 for The Man in the High Castle and in 2014 for True Detective. The studio has been a powerhouse at the Primetime Emmys over the past decade, with three wins and nine nominations since 2011. 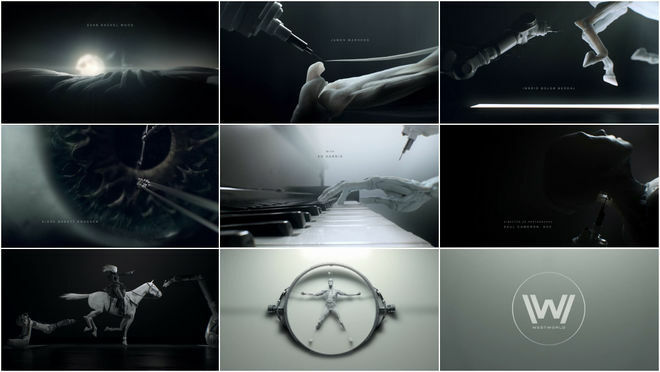 This is also the fourth year in which Imaginary Forces received recognition for its title sequences. The studio took home the gold trophy in 2015 for the opening title sequence to Manhattan, and was nominated previously for the titles to Netflix’s Jessica Jones, HBO’s Vinyl, Starz’s Black Sails, and HBO’s The Pacific. Prologue was previously nominated in 2012, 2013, and 2015 for their work on FX’s American Horror Story anthology series and in 2013 for the opening of CBS’s Elementary. This is the eighth Emmy nomination for Patrick Clair, Creative Director at Elastic, and the seventh for Michelle Dougherty, Creative Director at Imaginary Forces. Netflix, which made inroads into the category in 2015, saw two of its series honoured with Emmy nominations this year. Notably absent from the nominations this year is Amazon, which took home the prize last year thanks to Elastic’s main titles for The Man in the High Castle. As predicted in 2015, cable networks no longer dominate this category and we expect to see streaming services continue to make headway in the years to come. 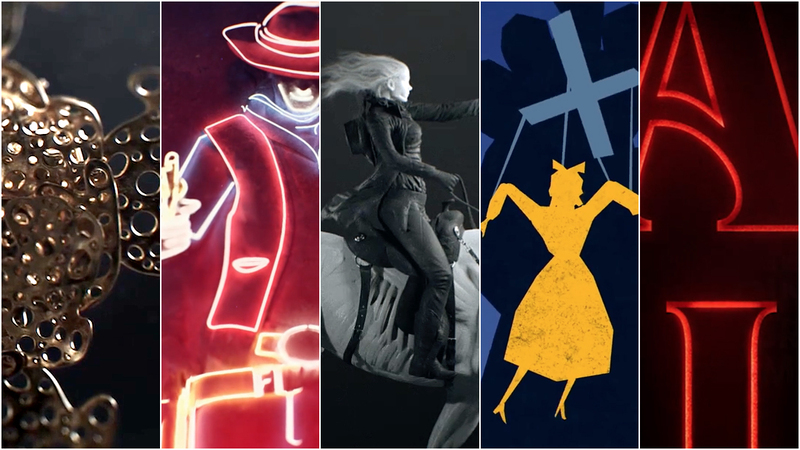 Title sequences that were grievously overlooked this year were those for Anne with an E (also known simply as Anne) designed by Imaginary Forces and featuring the gorgeous painted works of artist Brad Kunkle, Hamilton's Pharmacopeia, a fantastical hand-animated journey through the history of drugs created at VICE, and Lisa Bolan and Prologue’s crystalline opener for Queen Sugar. In related categories, two of the nominated title sequences – FEUD and Stranger Things – also received nods in the Outstanding Original Main Title Theme Music category. If this year’s Outstanding Main Title Design nods indicate anything, it’s that these studios are showing no signs of slowing down. Watch all of the nominated sequences below – and then let us know your favourites! Told through the point of view of an ex-con named Shadow Moon, Starz’s new series American Gods tells the story of a battle brewing between the new gods and the old. Developed by producer and screenwriter Bryan Fuller (Dead Like Me, Hannibal) and writer Michael Green (Heroes, Logan), the series translates Neil Gaiman’s fantasy novel of the same name into a psychedelic spectacle of deities and devils. 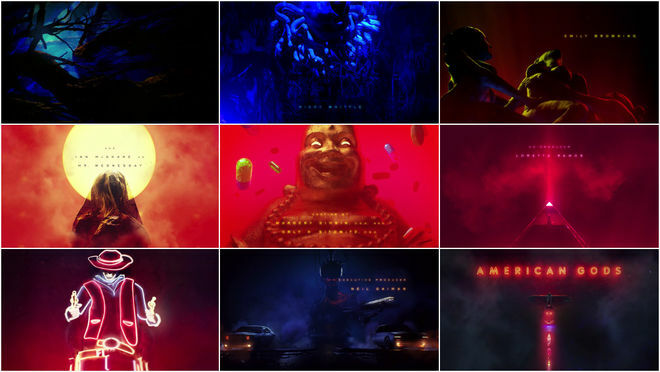 The opening title sequence sets up the show’s polychromatic and surreal world through iconography both modern and ancient, dousing classical artefacts, religious symbols, and modern technology in fuchsia and azure, chartreuse and crimson. The mood, musical theme, and pacing of the opening sequence is more than a little reminiscent of the titles for The Girl with the Dragon Tattoo, directed by Tim Miller. The theme music by Brian Reitzell for American Gods seems to echo Trent Reznor and Atticus Ross’s take on Led Zeppelin’s “Immigrant Song”. Even the vocals bear a resemblance to Karen O’s discordant howl. Still, the sequence is a stunning vision and a powerful herald for an ambitious series as well as a prime monument to the current era of title design. After numerous Emmy-nominated collaborations on the American Horror Story series, television producer Ryan Murphy and title designer Kyle Cooper of studio Prologue reteam for Murphy’s latest anthology series: FEUD: Bette And Joan – a dramatization of the events surrounding the production of the 1962 film What Ever Happened to Baby Jane? and the infamous behind-the-scenes rivalry of stars Bette Davis and Joan Crawford. 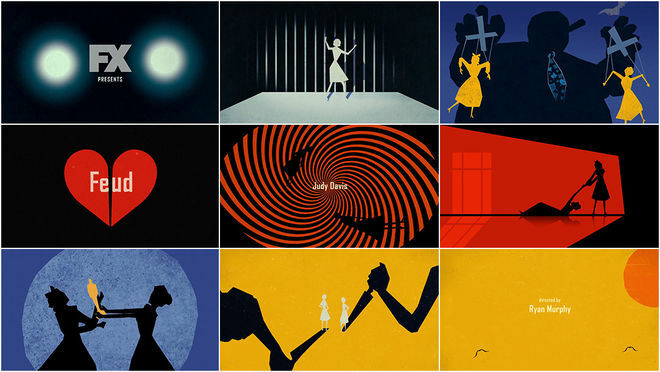 Set in the 1960s, FEUD’s highly stylized animated opener takes cues from the era in which it is set, in particular the title design of Saul Bass and the work of director Alfred Hitchcock. The sequence, which also owes a stylistic debt to Kuntzel + Deygas’s handmade opening to Steven Spielberg’s Catch Me If You Can, features direct references to Baby Jane and several Hitchcock thrillers – most notably Rear Window and Vertigo. With multiple acts of attempted murder and mayhem, the sequence’s sinister undercurrents make it clear to viewers that the enmity between Davis and Crawford is far more than just professional or personal jealousy, it’s a true life or death struggle for these two Hollywood legends. Netflix’s Stranger Things is a series loaded with subtle nods and not-so-subtle homages to some of the most beloved films of the 1980s. Showrunners Matt and Ross Duffer deliver a shot of pure nostalgia, a dose of something both familiar to viewers and altogether distinct. Similarly, the show’s main titles function as a tribute to some of the era’s most iconic book covers and title sequences, a pastiche of first impressions. Paired with a synthy title track straight out of a Carpenter flick, the Stranger Things sequence echoes the openings of genre classics like Altered States and The Dead Zone both in form and tone. Large, hollow type drifts through a void, slowly assembling, its glowing red edges cutting through the darkness as smaller credits fade in and out. The primary typeface is Benguiat, chosen for its associations with Stephen King paperbacks, the Choose Your Own Adventure series, and other dusty, musty touchstones. The Stranger Things opening is not only a fitting successor to a revered title design tradition, but a testament to the power of type in motion and the enormous potency of nostalgia. Read our in-depth discussion with Creative Director Michelle Dougherty of Imaginary Forces. Day breaks over an unfamiliar landscape. That’s not the sun and this is not the natural splendour of the American West. It’s the ribcage of a horse — not bred but built as an amusement park plaything. Robotic tools dance with precision, stringing piano wire and sinew alike, connecting key with hammer, muscle with bone. A pale rider takes to the saddle, half-formed and half-cocked, a six-shooter in her grasp. Check back on September 10th to find out which sequences take home a prize at the 69th Creative Arts Emmy Awards. And in the meantime, be sure to read our Top 10 Title Sequences of 2016 feature to see more of the best title design work of the last year.